A great beachside ambience for family gatherings, seaside cafes and stunning sunrise views. Keke Island is one of the closer and smaller islands off the coast of Makassar and offers sandy beaches and snorkelling. Bugis Waterpark is a fun-filled water park that features water slides, a bird park and cultural attractions. Fort Somba Opu combines a historical setting with the fun and excitement of a theme park. Situated around 12 kilometres south of the city centre at Sungguminasa, the park combines a water park with cultural performances, cultural attractions and traditional buildings in the Toraja, Makassar and Bugis styles. Malino Tea Plantation is situated around 70 kilometres to the east of Makassar on the lower slopes of Mt. Bawakaraeng, Malino was once a hill station resort for Dutch colonial residents in the area. With its misty hillsides clad in emerald green tea shrubs, it is still a remarkably beautiful and cool escape from the heat of the city. Take one of Makassar’s ubiquitous becak bicycle taxis to the Paotere Harbour where you’ll witness the world’s last commercial sailing fleet in action. With an area of around 20,000 square metres, Trans Studio Makassar is the world's third-largest indoor theme park. Fort Rotterdam is built on the site of a fort of the Gowa Kingdom dating back to the 16th century, Fort Rotterdam is located only 270 meters away from Swiss-Belhotel Makassar. Khayangan Island is the closest of several small islands situated a few kilometres off the coast from Makassar, and a popular weekend escape. With a hotel and restaurant facilities, this small tropical island features white sand beaches, and water sports such as snorkelling and jet-skiing. Losari Beach is situated on the hotel’s doorstep, Losari beach (Pantai Losari) is a long waterfront esplanade featuring bustling food stalls and night markets. Samalona Island is around 30 minutes by boat from Makassar, Samalona Island is another idyllic tropical island off the coast where you’ll discover white sandy beaches, coral reefs and clear waters perfect for snorkelling. The National Monument, or "Monas" as it is popularly called, is one of the monuments built during the Sukarno era of fierce nationalism. The top of the National Monument (Monas) is Freedom Square. Ancol Bayfront City, Asia's largest integrated tourism area consists of the fascinating Dufan theme park, Sea World, art markets, eco parks, shopping malls and beachside entertainment. The Queensland Gallery of Modern Art (GOMA) is an art museum located in the South Bank precinct of Brisbane. Hugging the northern side of the CBD, Roma Street Parklands and Spring Hill are iconic parts of Brisbane and its history. Roma Street Parkland, one of Brisbane’s premier parks, is considered to be one of the two best examples of contemporary display gardens in Australia. Brisbane Powerhouse is Queensland’s home for contemporary culture, a magnificent power station of the 1920s reborn as an arts centre on the Brisbane River. Eagle Street Pier is an iconic waterfront precinct with world-class dining options and unrivalled views of the Brisbane River and Story Bridge. The revitalised Museum of Brisbane is located on top of the newly restored Brisbane City Hall. Holding a significant place in the hearts of Brisbane residents as the ‘People’s Place’ City Hall has the enviable title of Brisbane’s premier heritage building. Suncorp Stadium, traditionally known as Lang Park, is the home of Rugby League in Queensland. A major $280 million redevelopment of the stadium was completed in June 2003 to convert it into a state-of-the-art all-seater stadium. Suncorp Stadium is one of Australia's leading rectangular stadiums, if not the world, and it plays host to many major events each year. The Brisbane Botanic Gardens Mount Coot-tha (located on Mt Coot-tha Road at Toowong) are recognised as Queensland's premier subtropical botanic gardens , displaying distinctly different gardens arranged in thematic and geographical displays. QPAC is the state's premier performing arts centre. Located on the banks of the Brisbane River and only minutes walk from the hotel. This site is considered one of the richest archaeological sites on the island of Sumatra, Jambi. 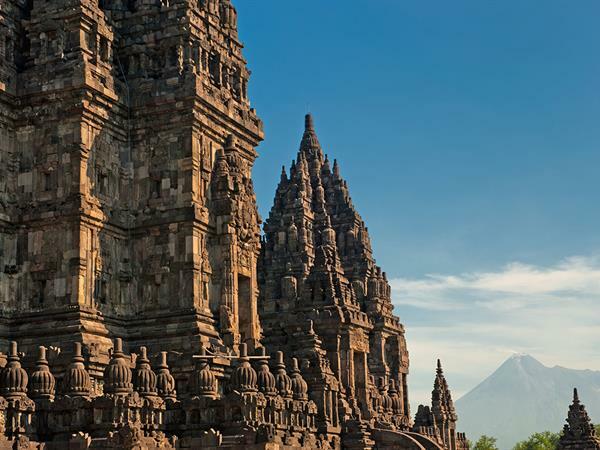 Muara Jambi Temple is only 22 kms away from Swiss-Belhotel Jambi and can be reach approximately about 60 minutes driving. Featuring many species of orchids and its own research and development laboratory covering an area of 25,056 sq meters. It is located 5 km from Jambi. The highest mountain on the island of Sumatra and the highest volcano in Indonesia outside of Papua. Kerinci Mountain located in Jambi Province and adjacent with West Sumatera Province. This mountain is surrounded by Kerinci Seblat National and natural habitat for Sumateran tiger and Sumateran rhino. Located in the Bukit Barisan Mountains, it occupies a total area of 1,484,650 hectares. The park is home to a great variety of animals species, such as elephants, Sumatran tigers, Sumatran rhino, tapirs, panthers, deer, wild goats, primates, crocodiles, birds and reptiles. Covers 28,703 hectares and is home to deer, monkeys, bears, wild pigs, elephants, snakes, iguanas and many species of birds. Small lakes are found in its surroundings and many small streams flow into the Batanghari river. Located 20 km from Sungai Penuh, the capital of the Kerinci regency. This is a popular tourist spot with beautiful panoramas. Home to over 270 species of animals and 171 species of flora. Pondok Indah Mall, one of the famous shopping malls in South Jakarta with waterpark beside the mall. Taman Mini Indonesia Indah or Beautiful Indonesia in Miniature Park is an extensive culture-based park, the prime showcase of Indonesia’s rich cultural and natural diversity located in East Jakarta. The Palace of the Pakubuwono Sultanate built in 1675 that combines traditional Javanese and classical European styles. Located close to Keraton Kasunanan. The batik products of Kauman village are made from weaving natural silk and premmisima cotton. Residential palace of the Mangkunegaran Princess built in 1757 with an awe-inspiring main audience hall. House of the 10,000 pieces private batik collection of batik magnate Santosa Doellah, the owner of Batik Danar Hadi, featuring a variety of batik from different cultural influences and periods - Javanese, Chinese, Indian and even colonial Dutch. Recognised by the Guinness Book of World Records, Lone Pine Koala Sanctuary is the world's first and largest koala sanctuary, with over 85 years of experience and 130 koalas. Those with a penchant for colour and creativity will love the Arbour, a kilometre-long walkway awning located in the Parklands. The Liana Lounge isn’t your average chair – this trendy piece of outdoor furniture has plenty of creative flair and is well-worth a sticky-beak. If you’re feeling adventurous and keen to see the sights of South Bank from a unique viewpoint, hop aboard The Wheel of Brisbane. Since 1980, Balai Pemuda function as Art Exhibition Centre of Surabaya inaugurated by the Mayor. Grahadi building is convention hall and the official resident of East Java Governor. See it’s a self remain as of the Dutch commissioner Dirk Van Hogendorp (1794-1798). Museum Surabaya is a new museum inaugurated on 3rd of May, 2015. This museum is built with a purpose for local societies and tourists to knowledge and understand the history of City of Heroes. Surabaya Submarine Monument or as known as Monumen Kapal Selam (Monkasel) is the largest submarine monument in Asia, which was built in riverside of Kalimas River, Surabaya. This monument was built by idea of Navy Veterans. Grand City Mall & Convention Hall, shopping center and venue for all types of events and trade shows. Mpu Tantular Museum built by Von Faber, a Germany collector and permanent in Surabaya. He started building the museum in 1922 and it was opened on 25 Junes 1937. Cheng Ho Mosque also known as Muhammad Cheng Ho Mosque, despite being a mosque, resembles a temple (house of worship of Tri Dharma). Heroes Monument, also known as Heroic Monument (Indonesian:Tugu Pahlawan) is a monument in Surabaya, Indonesia. It is the main symbol of the city, dedicated to the people who died during the Battle of Surabaya on November 10, 1945. Surabaya Zoo is located in the south of the city and is home to various tropical animals, like monkeys, deer's, zebra, lions, elephants, camels, dolphins, and orangutan. Tunjungan Plaza is located in the center of the city - Central Surabaya. It is a modern shopping center, built in modern architecture. Ku De Ta, Potato Head, and the W Hotel are absolute institutions in Bali. We can never be tired of these places no matter how many times we go. Nab a day bed, sip a cocktail, and watch a sunset. Do not forget to put the latest happening spots such Sun of Panama, Mrs. Sippy, La Brisa, and Finns Beach Club to your travel bucket list. DaMaria, Sarong, Sardine, Metis, Merah Putih, Barbacoa, Lantern, LaBaraca,… They’re the A list of Bali fine dining and yes ladies and gents, they’re all on Petitenget Street. The Wasur National Park forms part of the largest wetland in Papua province of Indonesia and has been the least disturbed by human activity. The high value of its biodiversity has led to the park being dubbed the "Serengeti of Papua". The vast open wetland, in particular Rawa Biru Lake, attracts a very rich fauna. The nature of Papua is not only be known for its virgin forest. Merauke also has beautiful beach. You may enjoy the beautiful of the lighthouse that stand up straight facing the ocean in Lampu Satu Beach. The view of the lighthouse is more beautiful on sunset. There is a monument in Merauke which is the twin of a monument located in Sabang, Monument of Sabang-Merauke. This monument was built as a symbol of the Republic of Indonesia from Sabang (Aceh) until Merauke (Papua). Beside Raja Ampat, Cendrawasih Bay National Park is famous among all under water lovers, especially for divers. This place is the largest National Marine Park in Indonesia. Recorded there are 209 type of fishes inhabit Cendrawasih Bay National Park, including Butterfly Fish, Angel Fish, Damsel Fish, Parrot Fish, Rabbit Fish and Anemone Fish. Prafi Dam is located in Prafi District and created by Minister of General Affairs, General Directorate of Water Resources via Papua rivers hall. Along the way to this dam, visitors can enjoy the beautiful panoramic such as highlands, hillside. Bakaro Beach is located in the north cost of Manokwari, side by side with Pasir Putih Beach. The unique of this beach is for the fish calling tradition. Calling the fish is usually done by the community who lives near Bakaro Beach to attract tourist visitors. Located about 5 km from central of Manokwari and can reach by car or motorbike for 15 minutes, this beach is very comfortable for recreation, swimming, sun bathing with its white sands and little wave. This area has islands with a beautiful panoramic and also a traditional fisherman village. Some of the islands are very good for diving activity because there are a lot of beautiful corals with its sea biota. Arfak Highlands is a conservation area, all visitors can be very satisfied because they can enjoy the tremendous scenery that mild such as forest, hill, and river. Traditional village and community life in here is still like in a stone age, the most interesting point here is the place is a home for approximately 320 type of birds, 110 type of mammals and 323 type of butterflies. Under water of Doreri Bay is filled with shipwrecks and one of the best site looked from its shipwrecks type in Indonesia. There are 3 little islands; Mansinam Island, Lemon Island, and Raimuti Island near by Arfai Beach, which has collections of unique and beautiful corals. In Ambon, one of the favorite spots for tourists is the beautiful Namalatu Beach. A beach with perfect the combination of coral and sand where you are able to see both the sunrise and the sunset. Siwalima Museum is located on Makmur Park Area, Amahusu Village, Nusaniwe District, Ambon City, around 5.1 km from hotel. Martha Christina Tiahahu (4 January 1800 – 2 January 1818) was a Moluccan freedom fighter and National Heroine of Indonesia. Next to Pattimura Park, there is the World Peace Gong. It is placed in Jl. Pattimura, around 8 minutes walking from hotel. Thomas Matulessy (8 June 1783 – 16 December 1817), also known as Kapitan Pattimura or simply Pattimura, was an Ambonese soldier and National Hero of Indonesia. The suburb of Al Qasba in Sharjah is home to plenty of entertainment options, but its most famous feature is the big wheel known as the Eye of the Emirates. As a settlement Sharjah has always been linked closely to the water, and the Maritime Museum highlights the importance of the sea in the city's development. Sharjah's Natural History Museum and Desert Park is a great place for children to learn about the flora and fauna of the Arabian Desert. Sharjah's Central Market is the city's most famous landmark. The intricate blue tile work on the exterior has given it the nickname the Blue Souk. Pintu Kota is one of the beaches in the area around the town of Ambon, which stores unique is the presence of a large hole through the rock cliffs on both sides until translucent. On the reefs which are hollow if we stood on the beach, then we can see the sea directly through the hole. Well known tourist site by people of the island of Ambon. The beach that located about 18 KM from the center of Ambon city is often selected by city residents who want to enjoy the day off. Watersport is the best activities in Bali for those who want something different not only swimming and snorkeling. In here for thrilling seeker you can pump up your adrenaline to the high level and do some fun with your family. Geger Beach also know as Nusa Dua Beach, Geger beach not really famous as Kuta Beach and Seminyak Beach in Bali because the located is a liitle bit hidden and far away from the hustle bustle that make travellers choose another beach as the favorite destination. Museum Pasifika (Nusa Dua Bali) is an art museum in Bali, Indonesia. It presents the Asian Pacific’s variety of cultural artefacts. The museum was founded in 2006 by Moetaryanto P and Philippe Augier. First opened to the public by Indonesia’s first President, Soekarno, on 22 February 1978, the grand Istiqlal Mosque of Jakarta is the largest mosque in South East Asia both in structure and capacity, as it can accommodate congregations of up to 120,000 people. One of the waterfalls along Cimahi river and Tangkuban Perahu Spring water. You can also visit a cave which is home to hundreds of bats. A stunning 25m high waterfall from Mount Sanggabuana. Located 35km’s from Karawang city centre, in Mekarbuana Village South Karawang. Located in Tegalwaru, 45km from Karawang and height about 20m and sorrounded by hill and great stone. Located only, 45 km north of East Karawang, this beautiful bay lays between the Subang and Karawang peninsulas. Enjoy local entertainment and cuisines like fresh grilled fish at traditional warongs along the beach. Traditional boats are also available for rent. Located approx. 70km’s from Karawang city through Jakarta-Kawarang to Rengasdengklok or Jakarta-Karawang through Cikarang. Guests can enjoy a wide range of water activities including swimming and banana boat rides. Ancol Bayfront City, Asia's largest integrated tourism area consists of the fascinating Dufan theme park, Sea World, art markets, eco parks, shopping malls and beachside entertainment. The people’s ‘Dreamland’ is a landscaped recreation complex popular with families. It has amusement rides and sporting and leisure facilities, including bowling but gets extremely crowded on weekends. The National Monument, or "Monas" as it is popularly called, is one of the monuments built during the Sukarno era of fierce nationalism. The top of the National Monument (Monas) is Freedom Square. It stands for the people's determination to achieve freedom and the crowning of their efforts in the Proclamation of Independence in August 1945. Bank Indonesia Museum (Indonesian Museum Bank Indonesia) is a bank museum located in Jakarta, Indonesia. It is officially founded by Bank Indonesia and was opened on 21st July, 2009. As your plane slowly descends for its approach to Jakarta’s Soekarno-Hatta international airport, you can see a large number of large and small islands dotting the sea in the Bay of Jakarta. These are known as the Thousand Islands, or Kepulauan Seribu. In fact they are a cluster of 76 coral islands with more appearing and disappearing with the tide. As the eldest mosque in samarinda located in Samarinda Seberang, was built in 1891 and announced as the second best historical mosque in Indonesia. Dayak community residence which located about 25 km from the city. You able to watch their traditional ceremony every year and will present their cultural dance every Sunday afternoon such as kancet Lasan, kancet Punan, Enggang Terbang, and more. Sarung Samarinda is authentically from Samarinda. In this village, you can see and try to tailor Sarung Samarinda. If you had the opportunity to visit the richest district in Indonesia, Kutai in East Kalimantan. Not complete if not visited Museum Mulawarman rich historical heritage Mulawarman kingdom. Mulawarman Museum formerly is the palace building Kutai Sultanate was founded in 1932 by Dutch Goverment. Built on 2000 as the third planetarium in Indonesia after Jakarta Planetarium and Surabaya Planetarium. Located at Jalan Pangeran Diponegoro, Tenggarong next to Mulawarman Museum. Isolated area located in South Kalimantan is popular by the name Loksado, a sub-district in Regency of headwater of South River which became a Dayak Tribe's house where they can live everlasting with the splendid landscape. To reach out this place, you will explore the heart of Meratus highlands.